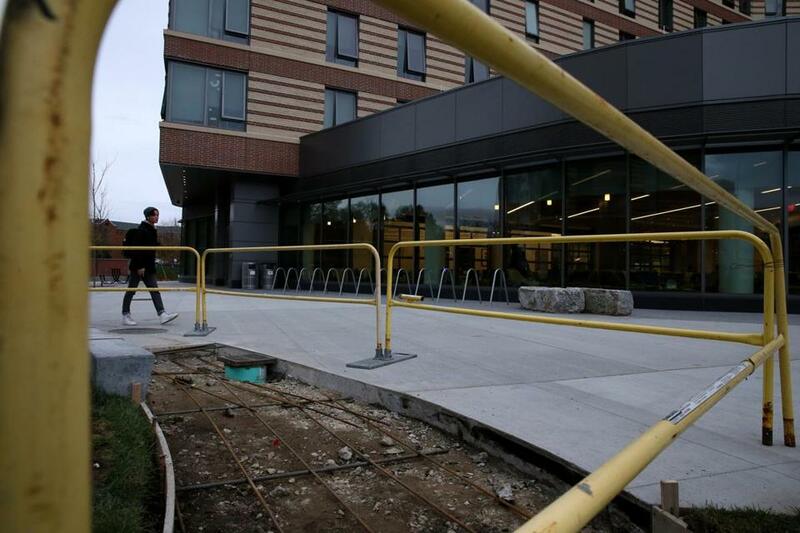 A section of sidewalk outside the new dorms at the University of Massachusetts. UMass Boston will swiftly implement new safety procedures at its dormitory in response to complaints from students that they feel unsafe, according to an e-mail sent Sunday to residents. The e-mail followed a Boston Globe story about a host of concerns students have about the new facility, which range from safety to water leaks to bad food in the dining hall. The dorm opened in September as the first residence hall at the longtime commuter university on Columbia Point. Students said security is so lax that residents easily swipe their friends into the dorm with their key fobs, and many unauthorized guests sleep in the common areas. They said the meat in the dining hall is often under-cooked, and the hot water often fails. One student had water shoot out of his toilet; another believes the poor quality of the water killed her pet goldfish. In her e-mail on Sunday, which was obtained by the Globe, interim chancellor Katherine Newman promised to fix the problems quickly and hold responsible the company that built the dorm. The university’s first residential students report a long litany of miseries, including raw hamburgers and a faulty elevator. The $120 million residence hall was built and is operated by Capstone Development, a private, for-profit company that contracted with the University of Massachusetts Boston. Student room and board fees go to Capstone, not UMass. “It is important that you know how the university is addressing these issues because this is your home, and your safety and comfort are my responsibility as Chancellor,” wrote Newman, who took over this summer as the campus leader while a search continues for a permanent replacement. Starting on Sunday, Newman said, uniformed guards would be posted at the turnstile entrances to the residence floors in addition to the staff that is normally on duty for that purpose. The UMass dorm consists of two buildings, one with 12 floors and the other with nine. The east building is open to the public because it has a cafeteria on the first floor, but the other requires a swipe key to enter. Officers will check student IDs to make sure only residents and their official guests, who must sign in, enter the dorm, the e-mail said. “We appreciate that this may slow entry into the building, but we believe this slight inconvenience is a small price to pay for your peace of mind,” Newman wrote. According to two students, on Sunday evening guards were stationed at the entrance to the elevators of the east building, but were not checking IDs. However, they were making sure each student swiped with his or her own key and did not let extra people in at once, students said. There was no extra security in the west building, according to one student. The e-mail reminded students that they must accompany their visitors at all times and said resident assistants will patrol the floors and common areas. “We expect them to treat all our guests with respect and courtesy, but we also have to insist that unattended guests cannot remain in the halls, especially if they are sleeping in common lounges,” the e-mail said. The e-mail also reminded students that the sale and possession of alcohol and other drugs is prohibited in the dorm, which is for freshmen only. Resident assistants plan to convene students on Tuesday night to review security rules and answer questions about them, the e-mail said. Students will also be able to voice any concerns about safety or building management at their meetings, the e-mail said. “Safety is our highest priority. We will monitor the impact of these improvements and will work with RAs, security staff and students to do more if need be,” wrote Newman, who was not available Sunday evening for an interview. As for the construction problems at the dorm, Newman said some have been solved but others have not been dealt with sufficiently. Faulty elevators, the chancellor wrote, have been fixed. Capstone shut down the elevator that plummeted with students aboard in September and repaired it. “That is what we expect for any safety-related repair, and we will make sure that this level of response continues to happen,” the e-mail said. As for the cold showers, Newman said the school is talking with Capstone, which has said it is working on repairs. The school will also review other construction-related issues reported in the Globe, the e-mail said, including leaks and ventilation in the kitchen. Capstone said in an earlier statement that it has responded to many of the problems, except some that required ordering parts or materials. Newman said she will meet with Capstone officials on Tuesday and review “every issue on the list, including their schedule for reviewing the cleanliness of the bathroom facilities,” which students said quickly become filthy on weekends. She also said she will review the quality of the food in the dining hall, which is run by the company Sodexo. Newman has called for the creation of a committee to recommend improvements to the food, as well as a third-party survey each semester of the food. She provided an e-mail hot line for students to give feedback. On Sunday evening, several students said they were impressed with the chancellor’s response, though they lamented that it took a newspaper article for officials to respond. “I’m glad the issues are being taken care of, and I hope she follows through on her promises,” said Rebecca Engel, a student whose goldfish died, she believes, because of the poor quality of the water in the dorms. Parents are also concerned about the dorms. Janet Boswell, of Winchester, said people pulled her aside at church on Sunday morning to ask if her son, who lives in the dorm, was OK. She said she knew the food was poor but had no idea the extent of the problems. “It seems like they’re doing even less than common judgment would require of securing a dorm,” she said. Boswell said the security concerns worry her the most. She said her son feels unsafe, and the RAs seem ill-prepared to handle the situations. “The one thing I was not counting on, in terms of him adjusting to being at school, was him feeling unsafe where he is living,” she said.